Hauʻoli makahiki hou! Happy New Year in the language of Aloha, especially significant this year as PB&A continues to support STG in their construction of the Light Rail in Honolulu, providing design for the three major trestles used to build the stations at Halawa, MoanaLua and Kilhi. We look forward to this new year as an opportunity to design the future! Our Client, Condon-Johnson Associates Inc., came to PB&A for a VE Design at the Saint Andrews Lift Station in Pismo Beach California. The design of the wall needed approval from the Army Corp of Engineers. PB&A’s design was approved and successfully built by CJA, with an outstanding outcome; saving construction costs without sacrificing structural integrity. Not to mention a fantastic sculpted shotcrete finished aesthetic, enhancing this beautiful part of our state expertly provided by Robert T. Hill Associates. The contract plans indicated placing a temporary soil buttress to stabilize the cut slope during construction, please see Figure 1. This requirement was challenging from the construct-ability point of view. Additionally, because of the proximity to the ocean, there was the possibility of the buttress being washed away in heavy surf and leaving the excavation exposed. PB&A provided VE by designing V-nails (please see Figure 2) that satisfied slope stability requirements and also provided support for the crane/drill rig pad at the top of the slope. An anticipated 1,000 engineers, contractors, manufacturers, suppliers, owners, government agencies, and scholars will meet in Anaheim to attend the informative technical sessions, visit 150+ exhibits showcasing the latest innovations in deep foundations technology, participate in technical committee meetings, and enjoy networking events. PB&A’s client, Kiewit hired us to design the temporary shoring wall for their McKlevey Park Detention Basin Project in Mountain View, CA. Due to the proximity of the property line there was very little tolerance for movement of the wall. Monitoring reports showed the wall only moved .03in. This is what we like to hear!! 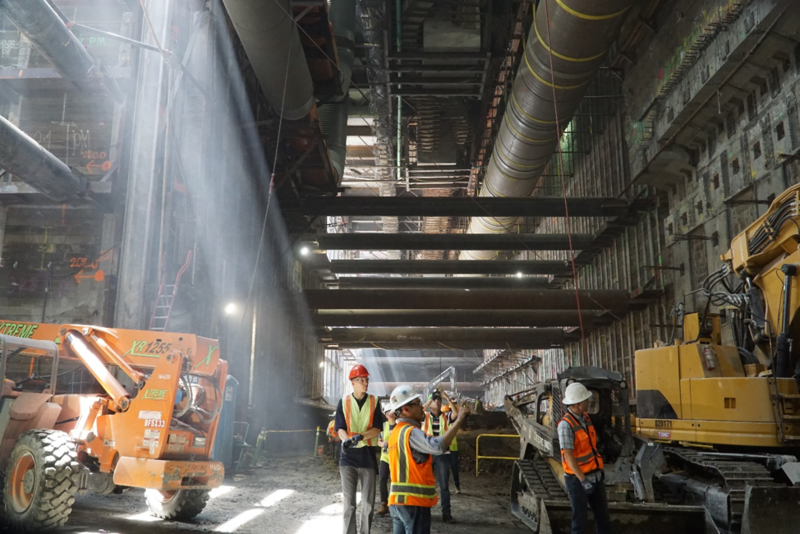 We are holding, along with DeepEx, a free webinar about “Experience, Design and Analysis of Shoring System for 2nd/Broadway Station” on Sep. 18 from 12:00 to 12:30 pm PDT. 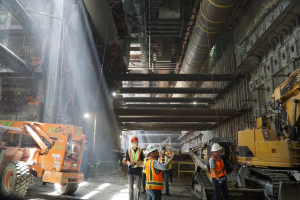 The 2nd/Broadway station is a part of Regional Connector Transit Corridor (RCC) expansion project for Los Angeles Metro and required a cut and cover excavation of 500 ft long by 97 ft. deep, underneath 2nd Street. If you are interested in learning more about our design, challenges and lessons learned, register for the free webinar using the link below. PB&A, Inc, is working with Shimmick-Traylor-Granite in Honolulu to bring the new HART Light Rail to Oahu. 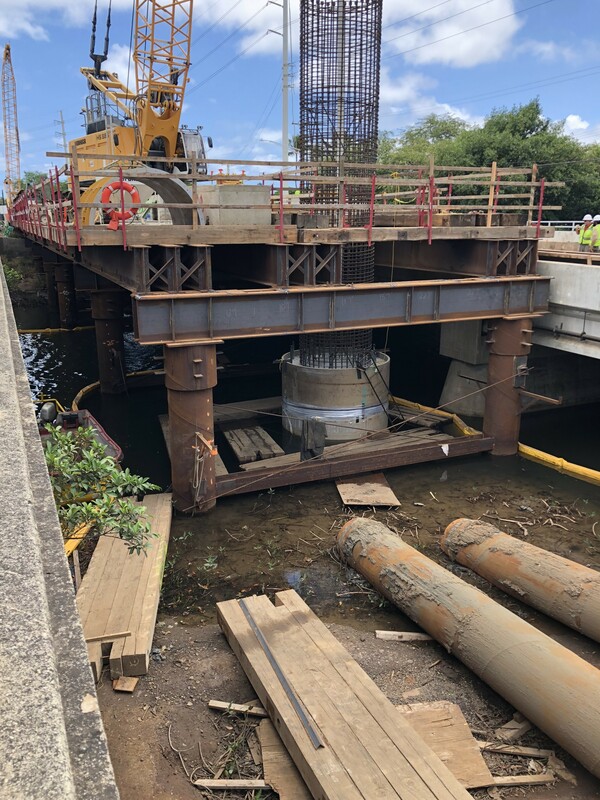 Our first trestle designed was built over the Halawa Creek to accommodate pier installation with heavy equipment including LB44 and HS895 crane. She served her purpose successfully and is now on her way out. Onward to Moana Lua! Tunneling Machine Dropped into PB&A’s “Hole”! Fantastic photos published by LA Metro of the tunneling machine being lowered into Wilshire/La Brea Station for the Purple Line Extension of the metro rail system. PB&A, Inc. has spent the past 4 years designing the Support of Excavation (SOE) systems for all 3 underground stations along Wilshire Blvd. at La Brea, Fairfax and La Cienega, along with the decking systems keeping Wilsire Blvd. live during construction. Kudos to the PB&A, Inc. team; Babak Mamaqani, PhD, PE, PMP, Sandy Soe P.E., and Manuel Linang who have spent most of their waking hours designing and drafting the shoring, and to Pirooz Barar S.E. who has spent the past 40 years dreaming of shoring innovation that makes the impossible, possible.